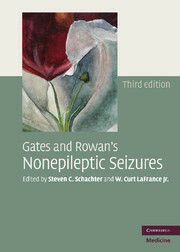 9780521517638 - Gates and Rowan’s Nonepileptic Seizures - Edited by Steven C. Schachter and W. Curt LaFrance, Jr.
Steven C. Schachter and W. Curt LaFrance, Jr.
All material contained within the DVD is protected by copyright and other intellectual property laws. The customer acquires only the right to use the DVD and does not acquire any other rights, express or implied, unless these are stated explicitly in a separate licence. To the extent permitted by applicable law, Cambridge University Press is not liable for direct damages or loss of any kind resulting from the use of this product or from errors or faults contained in it, and in every case Cambridge University Press's liability shall be limited to the amount actually paid by the customer for the product. Every effort has been made in preparing this publication to provide accurate and up-to-date information which is in accord with accepted standards and practice at the time of publication. Although case histories are drawn from actual cases, every effort has been made to disguise the identities of the individuals involved. Nevertheless, the authors, editors, and publishers can make no warranties that the information contained herein is totally free from error, not least because clinical standards are constantly changing through research and regulation. The authors, editors, and publishers therefore disclaim all liability for direct or consequential damages resulting from the use of material contained in this publication. Readers are strongly advised to pay careful attention to information provided by the manufacturer of any drugs or equipment that they plan to use.